The market of the Liquid Waterproofing for construction industry has produced many innovations in recent years. Our study includes the most important regions in Europe and analyses various product groups such as fluid polymer seals, bitumen waterproofing, cementitious waterproofing and others as well as application types such as balconies & terraces, flat roofs, parking decks, underground & bridge waterproofing, industrial buildings, walls and facades, tunnel constructions etc. 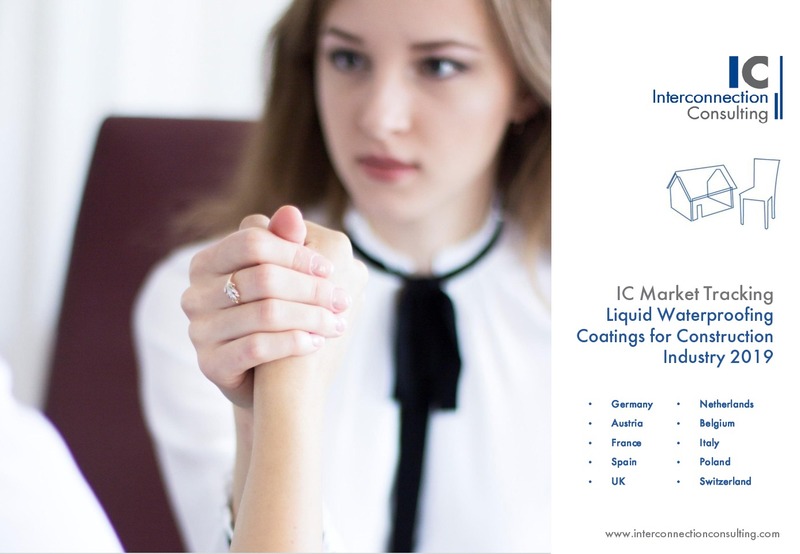 When it comes to a market report on Sealings & fillers of construction joints in Europe, Interconnection examines the markets for sealings, adhesives, PU foams and joint sealing tapes as well as a wide variety of application types, customer segments and joint types (wet glazing, connection and construction joints). In our market tracking on liquid waterproofing coatings and sealings, we provide the latest figures, facts and forecasts on the market volume, the market development as well as trends in product groups, application segments, etc., based on our economic indicator model that takes into account all relevant micro- and macroeconomic market-influencing factors in the individual regions. You will recognize the growth potential in certain segments or regions and thus receive valuable basic information for the strategic alignment of your company. Through our primary survey of manufacturers, distributors and industry experts, you will receive in-depth data on sales volumes in terms of quantity and value, average prices and market shares of companies in different segments. The outcomes are provided in the form of a PDF presentation coupled with our interactive pivot tool, which enables quick further processing of our data. 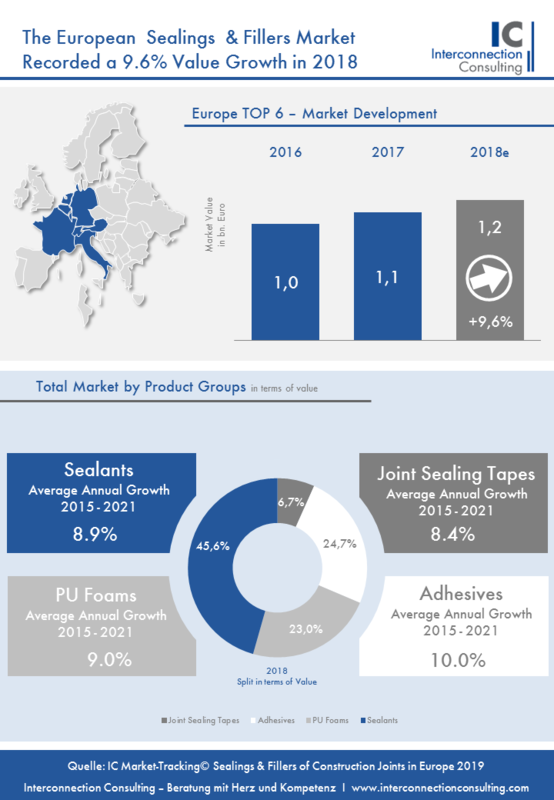 The European sealing and filler market (sealants, adhesives, PU foams, joint sealing tapes) increased in value by 9.6% in 2018, reaching a market volume of EUR 1.2 billion. Driven by the increase in the construction industry, the market is expected to maintain its momentum in the coming years. 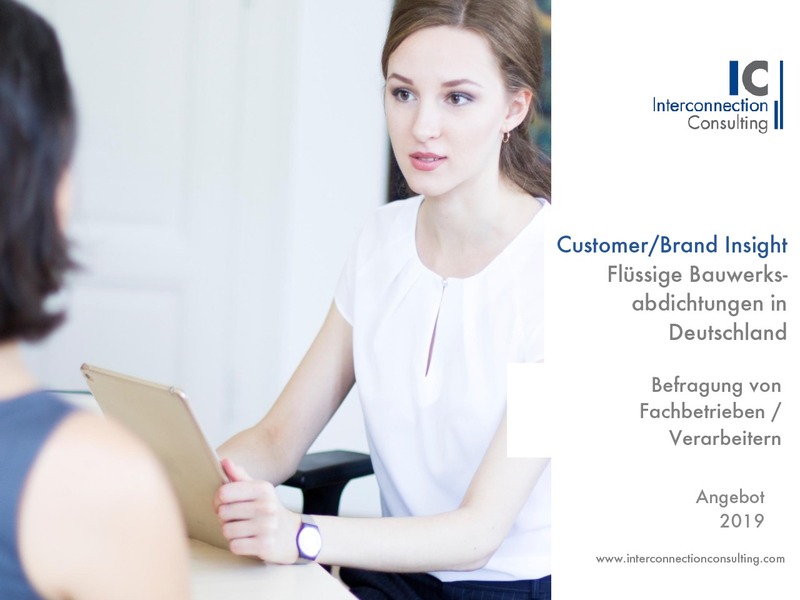 According to a new study by Interconnection Consulting, the industry in the surveyed countries (Germany, Austria, Switzerland, France, the Benelux region, and Italy) will increase in value at an average rate of 9.0% until 2021. Nearly 60% of total sales in Europe are generated in the non-residential building segment. In terms of value, however, price increases, which must be passed on to the customer due to increased raw material costs, are also a major driving force. Germany is by far the largest market for joint sealants in Europe, which is expected to grow at an annual rate of roughly 9.5% and reach EUR 547.2 million by 2021. France, the next largest market, had a share in value of over 25.0% of total sales in 2018. Sealants, accounting for 45.6% of total value in 2018, were the strongest product group on the market. It is dominated by silicones, whose share in terms of value accounted for 56.2%. Nevertheless, the market share of silicones is decreasing in favor of hybrids/MS polymers. “Industry insiders feel that hybrids, which will pick up the market share losses in the silicon segment, have great potential in the European marketplace,” states Julia Tarasenko, author of the study. The second largest product group is joint sealing tapes. Adhesives are close behind, though, with a share of 23%. They also stand a good chance of further increasing their market share. Until the year 2021, their projected average growth will be 10.0%, which is higher than the industry average. Joint sealants are largely employed in the window and door segment, which garners a share of 26.9%, followed by sanitary engineering and flooring. In addition to these applications, roofing, curtain wall facades, EIFS, HVAC, drywall and other applications were each analyzed, separately for indoor and outdoor use. 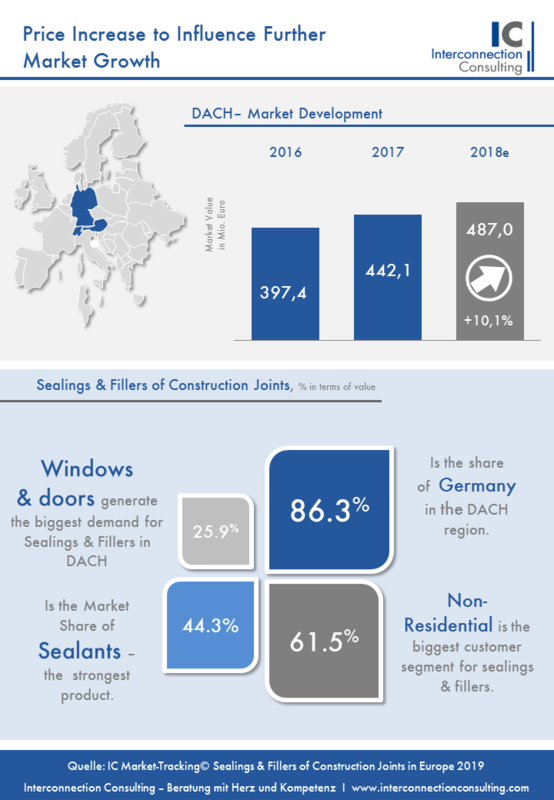 As the study shows, market concentration is likely to increase in the sealing and filler market in Europe’s top 6 regions. This is because companies need resources for research and development in order to keep up with the current “green trends” and to meet the corresponding regulatory requirements. The Italian market is already considered to be very saturated. As a result, local market players are having a tougher time expanding and are forced to either focus on other products and solutions, or to implement new solutions and technological innovations in order to gain market share from competitors.There is an abundance of companies in the European market for joint sealants, whereby the main players include Arkema Group, DOW Chemicals, EGO Sealants, Griffon, Henkel, Herrmann Otto, Mapei, Otto Chemie, Sika, Soudal, Tremco Illbruck etc. Der Markt für Fugenabdichtungen (Dichtstoffe, Klebstoffe, Schäume, Fugen- Dichtbänder) im DACH-Raum hat 2018 einen wertmäßigen Anstieg von 10,1% verzeichnet und hält nun bei einem Marktvolumen von 487 Mio. Euro. Getrieben durch den Anstieg in der Hochbauindustrie soll der Markt auch in den nächsten Jahren die Dynamik beibehalten. Bis 2021 wird das durchschnittliche Wachstum 9,2% jährlich betragen, wie eine neue Studie von Interconnection Consulting zeigt. Neben der starken Bautätigkeit stellen in Deutschland auch Preissteigerungen einen wesentlichen Treiber dar, die aufgrund gestiegener Rohstoffkosten an den Kunden weitergegeben werden müssen. Dies führt zu einem CAGR von 9,5% und einem prognostizierten Marktvolumen von 547,2 Mio. Euro bis zum Jahr 2021. Mit 46,1% sind die Dichtstoffe die stärkste Produktgruppe in Deutschland. Vor allem durch den Preisanstieg von Silikonen haben im Bereich der Dichtstoffe Hybride das größte Wachstumspotential. Klebstoffe sind die zweitgrößte Produktgruppe, die mit einem Anteil von 23,9% dicht gefolgt werden von den PU-Schäumen (22,7%). Auch in Österreich sind es hauptsächlich die Preisanstiege, die zu einer deutlichen Steigerung des Umsatzes beitragen (CAGR bis 2021 7,3%). In Österreich sind Klebstoffe mit einem Marktanteil von 35,2% die umsatzstärkste Produktgruppe, gefolgt von Dichtstoffen mit 30,1%. Danach folgen die PU-Schäume mit 27,2%. Ähnliches wie in Österreich gilt für die Schweiz, wo das CAGR bis 2021 6,5% beträgt. In der Schweiz sind die Dichtstoffe mit einem Anteil von 36,1% die wichtigste Produktgruppe. Danach folgen Klebstoffe mit 23,6% und PU-Schäume mit 21,3%. Die Marktkonzentration bei Fugenabdichtungen wird, wie auch in Gesamteuropa in der DACH-Region zunehmen. Denn die immer höheren Ressourcen die notwendig werden um Forschungs- und Entwicklungsaktivitäten durchzuführen, um mit den aktuellen „grünen Formulierungstrends“ Schritt zu halten und die einschlägigen regulatorischen Anforderungen zu erfüllen, werden vor allem größere Unternehmen bevorzugen. Die wichtigsten Unternehmen in der Branche sind Sika, Soudal, Tremco Ilbruck, Hermann Otto, Arkema Group EGO Dichtstoffe, Henkel, PCI.